If they had their choice, 63.1% of people would value "a great video game" over Huckleberry Finn. That's the result of a completely unscientific survey I conducted in two places: Twitter, and my recent blog about video games. The choice approached the abstract, because I didn't specify they had to play the game or read the novel. Like all web-based surveys, this one is a 100% accurate representation of whoever chose to vote, for whatever reason, whoever they were. In theory, no one could vote twice. I'm publishing the meaningless result as an excuse to discuss a few of my own notions. I would have voted for Huckleberry Finn. In fact, I recently told a reader that if forced to choose, I would sacrifice every video game in existence for the works of Shakespeare and not give it a moment's thought. Such mental experiments are folly. It's likely that if we ever do lose the works of Shakespeare it will be at the same instant we lose all the video games and everything else. Let me speculate about who mighty have been voting. I first announced the survey on my Twitter account. The initial result showed a 70-30% choice in favor of Huck Finn. Then I tweeted it again, and asked people to retweet it. The circle began to spread. I also added it to my blog entry. On June 30, the numbers stood at 55.2 to 44.8% in favor of Huck. The trend continued until video games took their present commanding lead. Your first assumption might be that gamers heard about the poll and raced over to take it. Maybe, but I don't think so. I think the 70-30 numbers are explained by the makeup of my blog readers and Twitter followers, and that as the poll fanned out more widely it became more representative of the population in general. 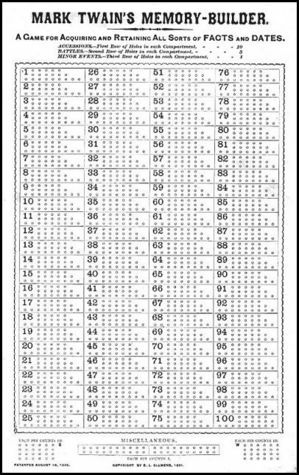 I believe it's quite possible that there is a 63 to 37 majority for video games -- probably larger. Oh, I heard from people telling me my poll was badly worded. I should have leveled the playing field by specifying (1) a specific video game, or (2) stipulating any "great novel." The poll was more or less created by the way it came up. A reader told me Mark Twain spent a year of his life inventing a game, delaying the writing of Huckleberry Finn in the process. Writers are gifted at procrastinating, but this seemed excessive to me and the reader suggested that if Twain had lived today he might have been a video game creator. What did he mean by that? 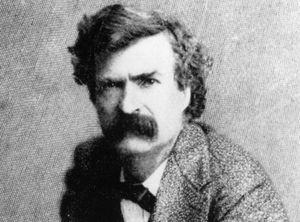 Perhaps that American literature too closely followed the British example until Twain wrote a book in American speech as he heard it growing up in Hannibal, Missouri, and was the first great writer to give voice to our native vernacular. More importantly: In the relationship between Huck and the slave Jim, he came early, unforgettably and influentially to that central fact of American life, racism. As Huck the scarcely literate boy slowly realizes that his friend Jim is a human being not deserving to be a slave (despite what his society had taught him), the reader is drawn to the same conclusion. For many readers, that would have been their first exposure to such an idea. Pretty soon it darkened up, and begun to thunder and lighten; so the birds was right about it. Directly it begun to rain, and it rained like all fury, too, and I never see the wind blow so. It was one of these regular summer storms. It would get so dark that it looked all blue-black outside, and lovely; and the rain would thrash along by so thick that the trees off a little ways looked dim and spider-webby; and here would come a blast of wind that would bend the trees down and turn up the pale under-side of the leaves; and then a perfect ripper of a gust would follow along and set the branches to tossing their arms as if they was just wild; and next, when it was just about the bluest and blackest -- fst! it was as bright as glory, and you'd have a little glimpse of tree-tops a-plunging about away off yonder in the storm, hundreds of yards further than you could see before; dark as sin again in a second, and now you'd hear the thunder let go with an awful crash, and then go rumbling, grumbling, tumbling, down the sky towards the under side of the world, like rolling empty barrels down stairs -- where it's long stairs and they bounce a good deal, you know. Read it over a couple of times and then read it aloud to someone you like. It's music. Can you imagine a more evocative description of a thunderstorm? For these and other reasons, choosing Huckleberry Finn over "a great video game" was a no-brainer for me. But no, no, I am not re-opening the debate about video games. That's over and done with. My previous entry was my last word. I'm beginning a discussion about Huckleberry Finn -- and reading. I believe reading good books is the best way we can civilize ourselves even in the absence of all other opportunities. If a child can read, has access to books and the freedom to read them, that child need not be "disadvantaged" for long. What concerns me is that reading competence and experience has been falling steadily in America. Most of the adults I meet are not very "well read." My parents were. My grandmother, born on a farm and raised in poverty, the mother of eight, was a voracious reader. Her 19th century high school education in Taylorville, Illinois, would have better equipped her for reading than most of today's university graduates. Beyond a certain point, we take our education into our own hands. We discover what excites us intellectually, and seek it out. The world of books allows us to walk in the shoes of people who lived in other times and other places, who belonged to other races and religions. It allows us to become more humane and open-minded. In exposing us to prose of the highest level, it encourages us to think in a way that isn't merely "better" but is more fanciful, creative, poetic and expressive. It makes us less boring, and less bore-able. 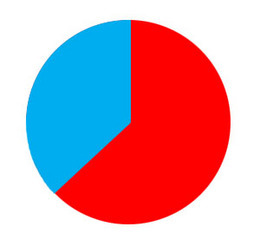 I don't know who voted in my little poll, and I don't know why they voted the way they did. All said to that first reader some weeks ago: "Show me a man who prefers a video game to Huckleberry Finn, and I'll show you a fool." Does that mean I believe 63.1% of the voters in my poll are fools? Not at all. I regret the hyperbole. Few people are born fools, and those we cannot help. I'm suggesting that some are still at a foolish stage, and have the freedom to evolve out of it. Sooner or later, they will either understand why Huckleberry Finn is more to be valued than a video game, or they will not. Getting to that point will be one of the best experiences in their lives. 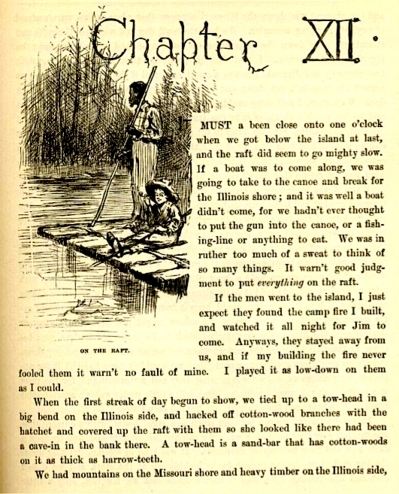 Downloadable for reading in any electronic format, with illustrations: The Adventures of Huckleberry Finn. Mark Twain creates a game. Play Twain's Memory-Builder Game.